I love “minimalist” pasta sauces. I find that the less ingredients you use, the quality of your ingredients becomes more important. Prepare pasta according to package directions. Drain, reserving about 1/4 cup pasta water. Set aside. Gently warm olive oil in a large skillet over medium heat. Add garlic and cook until garlic takes on a little color, about 1 minute. Add olives and tomatoes and cook until olives are warmed through, about 5 minutes. Taste for salt and pepper, then stir in half of the herbs. Add pasta to the skillet; stir. If the sauce seems too dry, add reserved pasta cooking water tablespoon by tablespoon until desired consistency is reached. Taste for salt and pepper once more. Spoon onto serving plates, top each serving with remaining herbs, then serve at once. This is my submission for Presto Pasta Nights #232, a weekly foodblog event currently hosted by Tandy of Lavender and Lime and organized by Ruth of Once Upon A Feast. 20 Sep	This entry was published on September 20, 2011 at 11:02 pm. 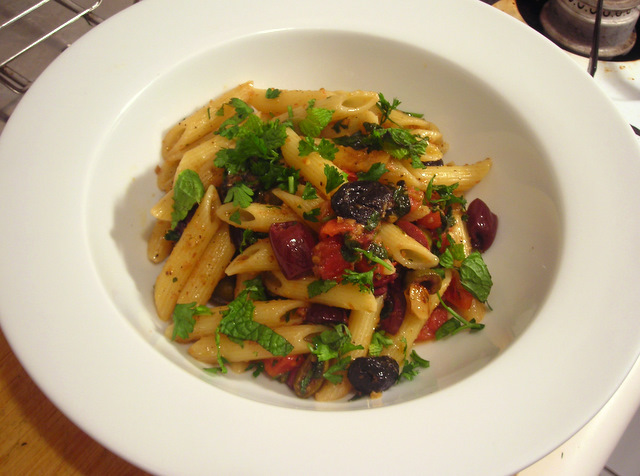 It’s filed under food, Italian food, Presto Pasta Nights, summer, vegetarian and tagged dinner, food photography, heirloom tomatoes, olives, pasta. Bookmark the permalink. Follow any comments here with the RSS feed for this post. this one looks wonderful, indeed. Like you, I love minimalist pasta – and this one looks particularly delicious. Thanks for sharing with Presto Pasta Nights.